I'm a big fan of Movie Tie-ins even though they generally turn out pretty dire. 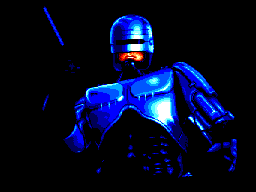 I've always loved the Robocop/Terminator films too so this game has been on my to play list for a while, the cover looks too cool for it to be terrible!!! So, can the game live up to my expectations, or is it another lame movie tie-in? 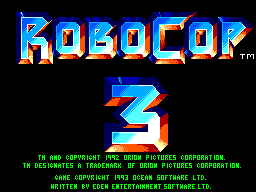 The game is set in two styles depending on the level: 1, 2, 4 and 6 are Run N Gun style levels, 3 and 5 are overhead vertical shmup's. The normal Run N Gun levels are pretty good fun, but the flying levels are more dodge it all than shoot 'em up! We'll start with the standard levels then, and there's not much to complain about. There's a decent range of weapon power ups available as you progress through the game, my favourite being the laser, but the three way shot comes in handy too. The odd enemy is pretty damn hard to shoot before you get hit, but there is plenty of power ups available to help you out. The level design is pretty good for the most part with the occasional platform jumping section thrown in. Nothing too complex thankfully, the jumps seem like the kind of jumps a slow and cumbersome cop/robot hybrid would be able to make. The bosses are the only real problem, and that's because they are too easy, some of the normal enemies are harder to kill. Even the final boss is a piece of cake. On to the flying sections. My first thought to seeing Robocop with the jetpack on was 'Cool! ', but as a shmup fan I soon changed my mind. The problem isn't the controls or anything, but the fact that the enemies take too many hits to take out, so if there is a few on screen you literally just have to choose a side of the screen and stick to it. you can power your weapons up but they still don't really have enough oomph to be able to tackle all the enemies the game chucks at you so you just end up reverting to dodging the attacks instead. The flying level bosses are pretty easy if you're a seasoned gamer and the attack patterns are rather easy to master. For the most part I was pretty impressed with the graphics. 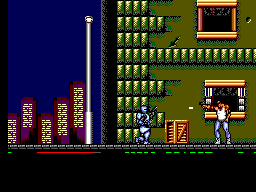 Robocop's animation is very nice, he actually feels clunky as he's moving around! For the most part the enemies are pretty nice looking too, with the only exception being the red things on the flying levels. All round though not much at all to complain about, ED209's appearance was a nice touch too. I don't remember much about the music, which in my opinion means it must have been OK. I generally only remember a games soundtrack if it's exceptional or terrible, so this must have been somewhere in the middle. Some of the weapons sounded a bit strange but you could still recognise what they were supposed to be. I really liked the controls in this one. The reactions were spot on, and whatever you asked Robocop to do he does, which is pretty important to be honest as you have to make some split second turn and shoots! The weapon select is pretty good too, by pressing down and jump at the same time you can cycle through all the available power ups you have found, on some levels that is pretty crucial as bullets can be a bit sparse in places. This is the only real problem with this game. Once you've worked out where everything is and how to get past the tricky sections (should only take an hour or two) then the game is pretty easy. Add to this the ability to change the amount of lives/continues you have available and this game becomes a pretty easy one to finish, and with no hidden items or different routes to explore there isn't much to make you want to have another go. This is by no means a bad game, but it's far from outstanding. I think I would have enjoyed it more if they had swapped the shmup style areas for more run n gun action. That said it is definitely worth a playthrough, and it'll take you more than a few runs to finish it without using a continue. If you give it a go be sure to check out the high score thread, I could do with some competition on this one as I'm the only entry so far!